William Evan Sutherland was born at R. R. # 2, Ingersoll, August 17, 1899, the second son of Senator the Honourable Donald and Mrs Minnie Hossack Sutherland. He also attended Dickson’s School and Ingersoll Collegiate Institute. Evan enlisted in the Royal Air Force in 1917. He joined the Oxford Rifles (Militia) following World War I, where he served as Lieutenant. He entered the army in 1940 as lieutenant. He trained at Camp Borden and was sent to Royal Military College for extra training. Evan’s duties included moving troops to Newfoundland and Labrador, then to Atlantic transports carrying them to England and Scotland. 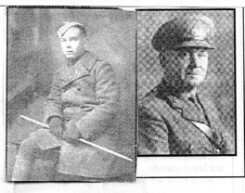 Evan had over 50 Atlantic crossings being in charge of transferring German prisoners from Britain to Canadian prison camps, and returning wounded Canadians. After the war he helped Canadians return home and moved British Prisoners of War captured in Singapore and Hong Kong also British and Dutch war brides coming to their new homeland. Evan was demobilized in 1946 as Lieutenant Colonel. He was awarded the Order of British Empire in recognition of bravery when the ship was under attack by enemy submarines. After the war Evan went to Oklahoma to Tinker Air Force Base as Administrative Inspector. He returned to his farm in West Zorra in 1956. Evan died December 27, 1987.